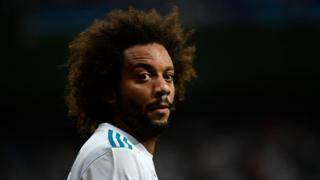 Real Madrid star Marcelo has been accused by Spanish authorities of tax fraud totalling €490,000 (£436,000; $576,000). The alleged irregularities are linked to the use of foreign firms to handle the earnings of his image rights, Madrid's public prosecutor says. The 29-year-old Brazilian player has yet to comment. He is the latest in a string of footballers to be pursued by the Spanish tax authorities. In the complaint, the public prosecutor said the defender, who joined Real Madrid in 2007, had used the tax structure seeking an "illegal fiscal benefit".